← Will My Muscle Turn to Fat if I Stop Lifting Weights? This is an all to common complaint and a question that baffles many people on a daily basis. Maybe you feel this is applicable to you and if not I can guarantee you that you will know someone to whom it is. You must have heard people complaining that they have a slow metabolism, or blaming all their issues on an undiagnosed thyroid problem. I personally couldn’t count the number of times I have been confronted with this issue, which is why I want to spend some time addressing it in detail. If you haven’t done so already you should begin by reading my piece on Energy Balance, as this will familiarise you with the basics as to why we gain or lose weight. The body is an incredibly amazing piece of equipment. It has the ability to adapt itself to best suit it’s current situation as well as being able to ensure we are prepared for the future. When we eat food we digest it and after a while all this broken down food finds its way into the bloodstream as carbohydrate (sugars), amino acids (proteins) and fats. Virtually all of what you eat will find its way into the body. Some people are under the false impression we can only absorb so much food at once through the gut, and that after a certain point, it doesn’t matter how much more we eat during a meal as it will just pass straight through. This can lead to them indulging in large binges as they believe this results in no more damage, but the only thing it results in is weight gain. Once in the blood the body has to decide what to do with these molecules, as they can’t simply float around the blood as there is no room. It’s solution is to use what it wants and store the rest. After a meal the body will use the sugar to provide it’s current energy needs and pack the rest away as glycogen in the muscles and liver for later use. Protein is either used up or oxidised for energy, and very little is converted into fats or sugars. Fat on the other hand is ALL diverted to storage, no questions asked. Later, after we have eaten, the blood levels of all these substances normalise as we have put all the excess into storage. We no longer have any food coming in, so to supply us with our energy needs we call upon our stores. This is mainly in the form of sugars and fats, and as we use them up we continually pull out more. This process continues until we eat again, replenishing our stores, and the cycle starts again. So why is all this important? Well what I want you to understand is that we only use or store what we eat and drink. There is no other source of energy for the body. If we don’t eat it then we cant store it. 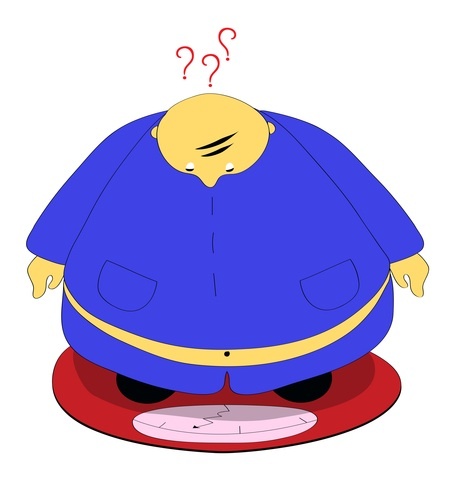 We cannot pluck weight from the air we breathe, it all comes from the food we eat. If we regularly eat more than we need to replenish our stores, we gain weight. If we consistently eat less than we need, we do not shut down, but instead take more and more out of our stores, and as a result we lose weight! The body has a constant need for energy to function. It is like a motor that is constantly running, so has a continuous need for fuel. This is the case even when you are sleeping. The rate at which we use energy is known as the basal metabolic rate (BMR), and varies between different people. In general however your BMR will remain fairly stable but will change as you put on or lose weight. Contrary to popular belief, the BMR isn’t really significantly effected by dieting. I make this point as some people will go around saying that when you diet you go into starvation mode and slow your metabolism as a result. This may be the case in extreme starvation but shouldn’t really noticeably effect you. If you did as suggested and read my piece on Energy Balance, you will know that you can top up the energy you use per day by being more active in daily life and by doing exercise. This does not add a huge amount (for most people BMR will still form the bulk of energy used), but is very important as it is often what makes the difference between staying static or losing weight. So if you are dieting and consuming less calories than you are using on a daily basis, YOU WILL LOSE WEIGHT. So this brings us to the question of why those people who tell me they are dieting and exercising don’t lose weight? Well now you know the theory you can probably answer this question for yourself. It is because they are eating more than they think they are. This is not necessarily their fault as they are often not aware, or have been incorrectly educated on the contents of the food they consume. It is amazing how much people can underestimate what they eat on a daily basis. If you secretly write down all the food a person consumes on a daily basis, and then get the person to recall all the food they think they have eaten at the end of the day, you will often find there is a significant discrepancy. This is why studies involving recall diaries are often not very useful. There are very few medical conditions that cause somebody to be unable to lose weight, and they are very rare. Occasionally medications can result in weight gain and if you are still concerned that you suffer from one of these, visit your physician and they should be able to fairly quickly exclude them, allowing you to concentrate all your efforts back on losing weight. So if you have been stuck in this position for a while what should you do? Well I still feel the most important step is understanding that the most likely reason you haven’t lost weight isn’t because you can’t, but instead because you haven’t been going about things the right way. Once you realise this you can make positive steps to start a successful weight loss program. First of all read my other articles explaining what is in the food you eat and on how to diet. Once you have this basic understanding, start a food diary. To get the most out of it, don’t change anything but instead just eat what you have always been eating. After a week sit down and analyse the diary. You should now have the insight to see where you have been going wrong. Only once you identify and understand your own mistakes (rather than just having someone dictating your errors to you) you will be rectify them and start losing weight. Dr Murtaza Ahmed is a General Practitioner sub-specializing in the field of Sports, Exercise and Nutritional Medicine. He graduated from The University of Nottingham, England, and in addition to his medical qualification he holds a Masters in Sports and Exercise Medicine (MSc), Bachelor of Medical Sciences (BMedSci) and Membership of the Royal College of Physicians (MRCP London). This entry was posted in Diet & Exercise and tagged can't lose weight, crash diets, diet and nutrition, diet protein, exercise, failed diet, failing diet, fat, help me lose weight, new diet, nutrition, overweight, rapid weight loss, slow metabolism, thyroid problem, unable to lose weight, weight loss. Bookmark the permalink. 1 Response to Help! I’m fat and on a diet but can’t seem to lose any weight. Pingback: Weight Loss – Know the Secrets that Keep You Beautiful and Slim | All About Caring !